At the push of a button, the highly flexible report designer issues reports such as project summaries, budget lists, expense reports and plan/actual comparisons in a variety of file formats like Microsoft Excel, Microsoft Word, HTML, PDF and many more. Click Projects on the Outlook Ribbon to switch to the InLoox PM project overview. Choose one or more project in the project list. On the InLoox PM tab, in the Reports group, click Reports and choose from the drop-down Create Report. In Outlook 2003/2007 click Reports in the InLoox PM Toolbar. 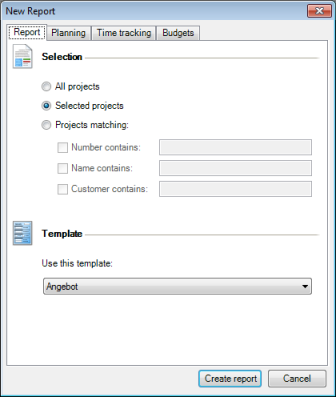 In the New Report dialog box, in the Selection area choose All project, or Selected projects, or Projectts matching. Click Create report after you have made all changes you want. In the Print Target area, in the Direct to... filed choose in the drop-down list the output format, e.g. PDF, Excel or Word. In the Options area specify individual pages or sets of pages to be printed. How to create a report in InLoox PM 7 • Copyright 1999-2019 © InLoox, Inc. All rights reserved.